Not able to log in to democracy earth. (vote.blockstack.org). Strangely, it seems like its trying to retrieve the manifest file via a HTTP link as opposed to HTTPS. Yikes! That’s not good. I’ll make sure the app mining teams gets in touch with them. Thanks for the report, clydedcruz.id.blocks. 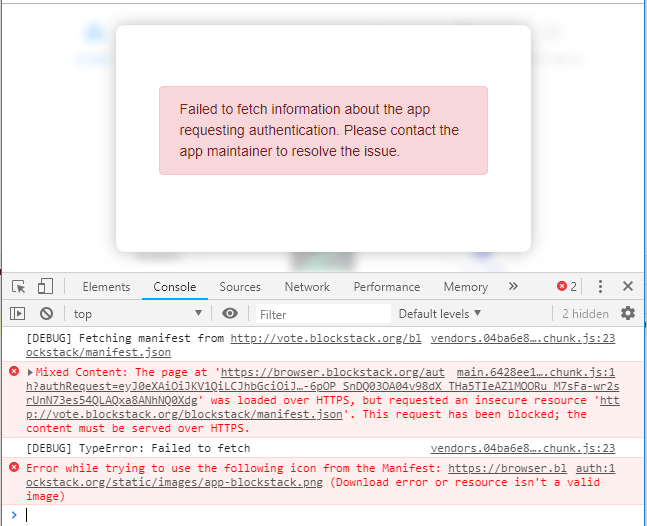 I was able to recreate this problem when using the hosted browser (browser.blockstack.org), though logging in did work with the downloaded Browser (https://blockstack.org/install/), so you may want to try that while we figure out why the former isn’t working. Alternatively, if you simply visit https://vote.blockstack.org instead of http://vote.blockstack.org, that should work as well (since I’m seeing it work for me with the hosted browser, too). That’s probably even easier than downloading the Browser. Thoughts @hank or @yukan on whether this is a configuration issue on Democracy Earth’s end or ours? Hey @clydedcruz.id.blocks I’m with Democracy Earth, thanks finding and reporting this bug! And thank you @markmhendrickson for the extra info as well. Will be looking into this as soon as I can, it’s possible it is a configuration issue on our end. @clydedcruz.id.blocks could you please confirm the browser you were using is Chrome? Looks like it from the image. @cyberghosts.id.block just updated our configuration, you should be able to login now in both hosted and downloaded browser. Please do let me know if that’s not the case, thanks again for raising this issue! @medied yes. It was Chrome.